As I drove to San Luis Wednesday, my mind went back to the days of the pioneers. None of the first homesteaders had running water, flushing toilets or electricity and they somehow hung on to build the San Luis Valley into what it is today. It seemed odd, then, to see people whose valiant fight for land rights do verbal and nearly physical battle with newcomers who had bought small “ranches” and sought to live on them. Then I remembered the struggle waged by tribal people to hold onto land that was taken by outsiders who felt that they were destined by God to take the land. When I was small, I constantly heard the story of the dog in the manger, who didn’t want the straw there, but menaced those who truly wanted it. Colloquially, it refers to a person who selfishly keeps something that he or she doesn’t really need or want so others may not use or enjoy it. As I heard the exchanges, it became evident that there were two issues involved, race and water. The Golden Rule didn’t apply. Men and women cried out that the settlers were illegally taking water, while the homesteaders declared that they were buying water wherever they could. Reading signs that characterized the newcomers as “scumbags” and “lazy trash,” I wondered how the sign bearers would feel if they had been called such names. In fact, they were called names by employees of a man named Jack T. Taylor from New Bern, N.C., who had bought the vast mountain tract for pennies per acre in tax sales. The minions were just following orders and fought the descendants of original land grants for wanting ancestral rights to hunt, fish and cut firewood on land they considered theirs. The Treaty of Guadalupe Hidalgo protected those rights, but Taylor obviously didn’t think the treaty applied to him. It has become evident that some believe the U.S. and the Colorado Constitutions shouldn’t apply equally to everyone who lives or seeks to live in Costilla County. I was confronted by a man who called me a coward and said I wouldn’t dare tell him my name. I did so in a proud, firm voice, noting that I was there representing the newspaper. He asked me whose side I was on, and I said I am on the side of fairness. He recognized the surname and called me a sell-out in Spanish. I didn’t answer him, but my heart hurt. To hear one sign bearer shout that he lives in a beautiful home while degrading the people who are trying to build their own dwellings on the land hurt my heart. My heart hurt for the people who have long struggled for rights to their ancestral lands, only to receive keys to gates in fences they don’t want. 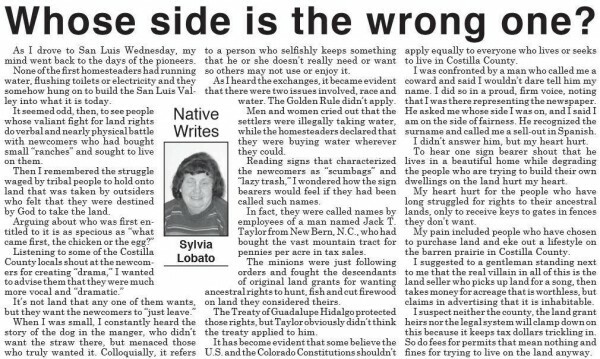 My pain included people who have chosen to purchase land and eke out a lifestyle on the barren prairie in Costilla County. I suggested to a gentleman standing next to me that the real villain in all of this is the land seller who picks up land for a song, then takes money for acreage that is worthless, but claims in advertising that it is inhabitable. I suspect neither the county, the land grant heirs nor the legal system will clamp down on this because it keeps tax dollars trickling in. So do fees for permits that mean nothing and fines for trying to live on the land anyway.